For the first time, scientists using NASA’s Hubble Space Telescope have witnessed a massive object with the makeup of a comet being ripped apart and scattered in the atmosphere of a white dwarf, the burned-out remains of a compact star. The object has a chemical composition similar to Halley’s Comet, but it is 100,000 times more massive and has a much higher amount of water. It is also rich in the elements essential for life, including nitrogen, carbon, oxygen, and sulfur. These findings are evidence for a belt of comet-like bodies orbiting the white dwarf, similar to our solar system’s Kuiper Belt. These icy bodies apparently survived the star’s evolution as it became a bloated red giant and then collapsed to a small, dense white dwarf. As many as 25 to 50 percent of white dwarfs are known to be polluted with infalling debris from rocky, asteroid-like objects, but this is the first time a body made of icy, comet-like material has been seen polluting a white dwarf’s atmosphere. The results also suggest the presence of unseen, surviving planets which may have perturbed the belt and worked as a “bucket brigade” to draw the icy objects into the white dwarf. The burned-out star also has a companion star, which may disturb the belt, causing objects from the belt to travel toward the burned-out star. Our own Kuiper Belt, which extends outward from Neptune’s orbit, is home to many dwarf planets, comets, and other small bodies left over from the formation of the solar system. Comets from the Kuiper Belt may have been responsible for delivering water and the basic building blocks of life to Earth billions of years ago. 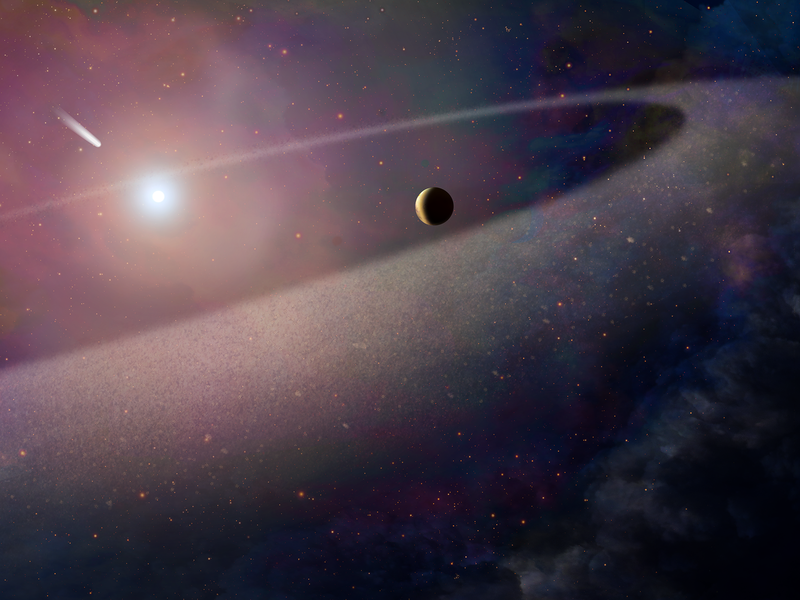 The new findings are observational evidence supporting the idea that icy bodies are also present in other planetary systems, and have survived throughout the history of the star’s evolution. To study the white dwarf’s atmosphere, the team used both Hubble and the W. M. Keck Observatory. The measurements of nitrogen, carbon, oxygen, silicon, sulfur, iron, nickel, and hydrogen all come from Hubble, while Keck provides the calcium, magnesium, and hydrogen. The ultraviolet vision of Hubble’s Cosmic Origins Spectrograph (COS) allowed the team to make measurements that are very difficult to do from the ground. This is the first object found outside our solar system that is akin to Halley’s Comet in composition. The team used the famous comet for comparison because it has been so well studied. The white dwarf is roughly 170 light-years from Earth in the constellation Bootes, the Herdsman. It was first recorded in 1974 and is part of a wide binary system, with a companion star separated by 2,000 times the distance that the Earth is from the sun. The Hubble Space Telescope is a project of international cooperation between NASA and the European Space Agency. NASA Goddard manages the telescope. The Space Telescope Science Institute (STScI) in Baltimore, Maryland, conducts Hubble science operations. STScI is operated for NASA by the Association of Universities for Research in Astronomy in Washington, D.C.